Svanubhava was conceptualized with the intention of welcoming the students to the diverse, multicultural world of Indian art and introduce them to the underlying beauty of even the rarest forms. 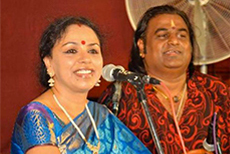 Sudha Ragunathan interacted and performed for the students of Jaffna and received a warm and affectionate welcome. Her music brought peace, divinity and happiness in this strife torn land and it is her prayers to the Almighty that this beautiful place is blessed with peace and prosperity always.